Asetek demonstrated its ISAC (Inside Server Air Conditioning) technology at SC12. This new technology eliminates the need for server room air conditioning, it works by equipping each CPU with a liquid cooler and using a radiator to cool the inside server air. Asetek® Inc., the world’s leading supplier of liquid cooling solutions for computers announced today that it will showcase its patented ISAC™ (Inside Server Air Conditioning) reference design at SC12 in Salt Lake City, Utah - November 12-15. This is the first time it will be displayed to the public. Formal presentations and live demonstrations will be available at Asetek’s booth #4045. ISAC™ is revolutionary, completely eliminating the need for CRAC (Computer Room Air Conditioning) in the data center. All air inside the server stays inside the server and recirculates rather than exiting and heating up the data center which also significantly relaxes the air dust quality spec inside the data center. Each CPU is liquid cooled with Asetek’s proprietary liquid cooling while a liquid-to-air heat exchanger inside the server cools the inside server air. Each component inside the server sees the same temperature and air-flow as it would in a traditional data center install. The ISAC™ server will integrate with Asetek’s RackCDU™, providing substantial data center infrastructure cost savings. Because 100% of all server heat is being transported into the water, users should expect savings of at least 60% on their cooling power bill, often with immediate payback. Because the hot water generated from the RackCDU™ can be reused for facilities heating or cooling, data center operators now can achieve EREs of <1. 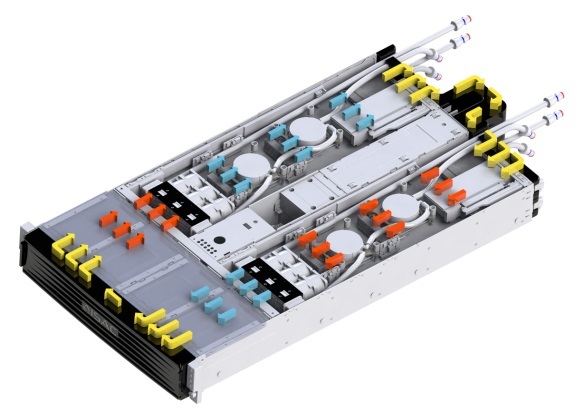 In addition to saving power in data centers, the ISAC design has a strong value proposition where dust and other environmental factors are a challenge. Forward looking military operations, field operations, container data centers as well as Formula 1® paddock data centers will benefit from the sealed design.